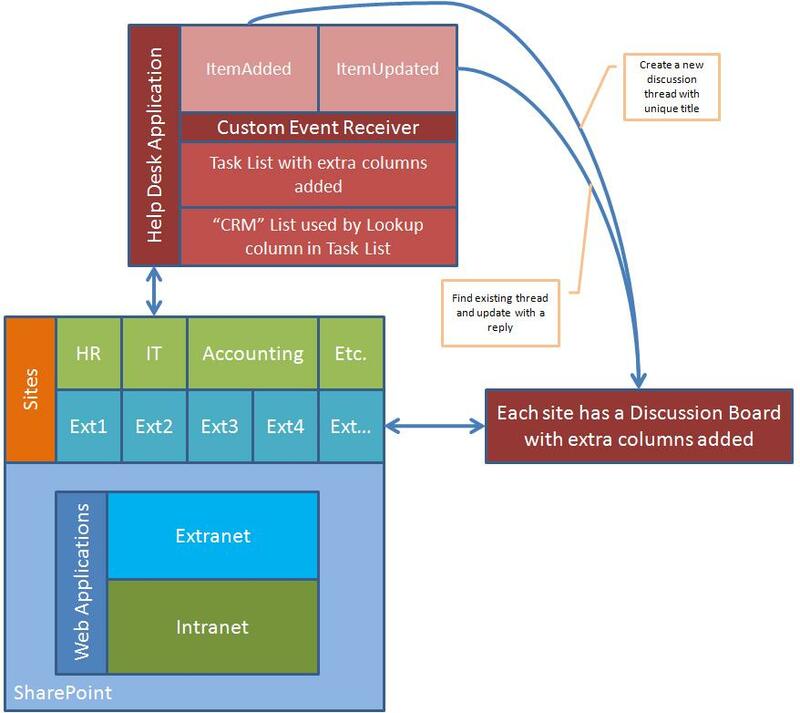 You’ve built a centralized help desk/issue tracking system within your intranet site for all of your employees to use. There are also personalized views for this list (based off of a SharePoint Task List) so that your internal customers can view status updates on their tickets whenever they want. You also have a bajillion extranet sites you have to support but you don’t want to give those extranet users access to your internal issue tracking system/list. But you do want them to be able to see the status of their tickets and be “social” with it from their respective extranet sites. What do you do?! 5. Create a custom event receiver to replicate the ticket in a list on the extranet site… hmm, that sounds like #2 and not very “social”. 6. Create a custom event receiver that writes the ticket information to a discussion board thread on the extranet site and replies to the discussion thread when ticket information is updated. Hmm, this sounds interesting. I can write to any column I want in the discussion board… I can update the thread so that users can reference later… users can reply using the discussion board… ding! ding! ding! Can you tell I had some time on my hands? Check back later for part 2! Any chance of this series getting continued? I would love to see your solution. Hiya, This is an excellent synopsis, I located your blog checking google for any equivalent theme and found this. I couldnt find too much other information and facts on this posting, so it was wonderful to discover this one. I am going to probably often be returning to look at various other articles which you have written another time. I honestly appreciate individuals like you! Take care!